Patriarch Youssef Raji El Khazen was still in school when he started his ecclesiastical career. He was a man truly devoted to God and was endorsed and blessed as a priest on the 6th of November in 1814 after receiving various previous honors. It was Bishop Youssef Khairallah Estephan who blessed his promotion to priest. 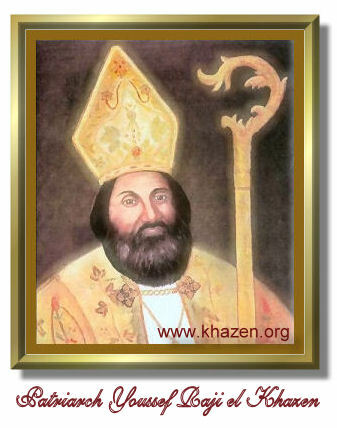 On the 6th of April 1830, he was named Damascus Bishop by Patriarch Youssef Hobeiche the great. Patriarch Youssef Raji El Khazen was originally from Ajaltoun and followed his studies at the renowned and famous Ain Waraka school. After the death of Patriarch Hobeiche, a general Maronite assembly was requested to vote for a new patriarch and took place 9 days after his death on the 16th of May 1845. This delay is mainly explained by the bad security situation in Lebanon due to wars back then. Here is a list of the attendees at St.Maroun Church at the Maronite Patriarchal seat in the North. There were also two priests present, Youssef el Mareed and Boutros Mansour, in charge of keeping record of the elections and any incident reported. The outcome of this assembly was voting for Youssef Raji El Khazen as the new Maronite Patriarch of Antioch. Many rumors spread prior to Raji el Khazen’s election that election were a fraud and protested by many bishops and groups, however the Pope confirmed that Patriarch Youssef Raji El Khazen’s was genuinely elected and gave him the apostolic blessing. One of the stories that were spread is found in Bishop Youssef el Debs book on Maronites’ history. He narrates that Bishops met in Our Lady of Mayfouk monastery after Patriarch Hobeiche’s death and voted for Bishop Youssef Raji El Khazen as the new patriarch and headed to the North patriarchal seat to confirm and celebrate the election. However Bcharreh residents regrouped and protested against the new Patriarch as they wanted Bishop BoulosMassaad to win and doubted the outcome of the elections. “After Patriarch Youssef Hobeiche had died at the patriarchal residence North of Lebanon, all bishops agreed to hold a general assembly. They first called on all Bishops to come to the North for the voting, however many were worried that elections might not be held properly and the freedom of voting might be compromised by the place and time specially that Lebanon was in times of war. This led to the interference of French consul in Beirut who sent his personal associate to guarantee the adequate circumstances for holding the elections. After convincing all bishops to attend, Bishops from Keserwan were the first who headed to the St.John Maroun monastery in Diman. Being mostly from El Khazen noble family, locals in Bcharreh first sought Knights from the Khazen family came to impose their candidate for the new patriarchal seat, before the French consul intervened once again to ensure the legitimacy of the elections. Elections took place and Youssef Raji El Khazen was voted as the new Maronite Patriarch of Antioch. In an attempt to protest this outcome, certain groups tried to protest and make a scene before Sheikh Boutros Karam and French consul’s messenger calmed them down and advised them otherwise. Patriarch Youssef Raji El Khazen was elected on the 18th of August 1845 as the new Maronite Patriarch of Antioch and he resided in Our Lady of Bechara in Zouk Mikael, Keserwan. Upon his election, he dispatched a letter to Rome through his messenger Nicolas Mrad asking for the papal blessing. Few days later, he received a letter from his beatitude Pope Gregory XVI blessing his victory and confirming the elections.